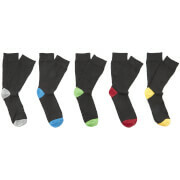 Men’s 3 pack footie socks from Puma. Made from lightweight, stretch cotton, the liner socks are designed for comfort and style, forming a low profile and seamless design to be worn with a range of shoe types. Complete with contrast Puma branding.